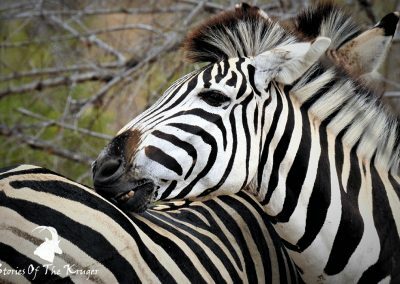 The Malelane to Skukuza drive, or route, is one of our favourites in the Kruger National Park. 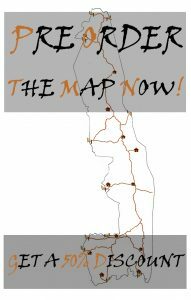 We must have driven this route 50 times at the time of writing this. 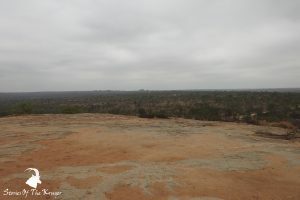 It is the H3, from Malelane to Skukuza, via Afsaal and a few waterholes. Pretoriuskop and Numbi Gate can also be reached via this drive. 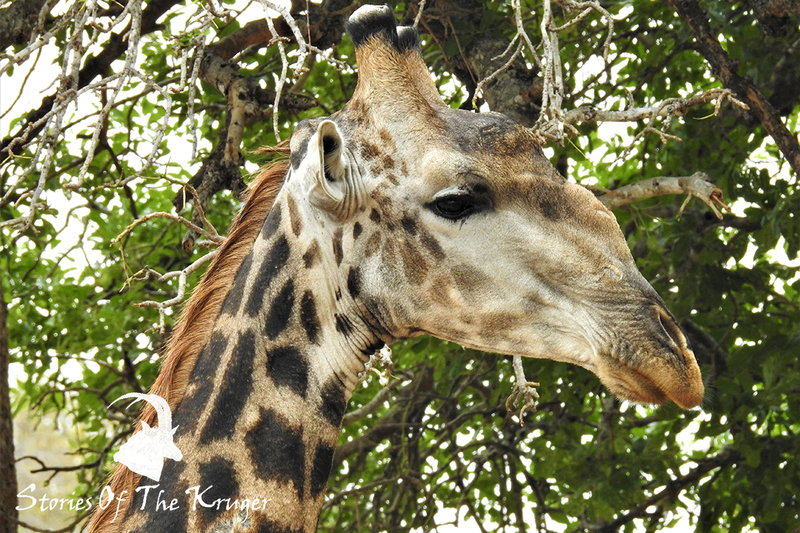 It is a scenic way to explore the Kruger and has so much to offer. We have seen almost everything and anything you can imagine on this road. 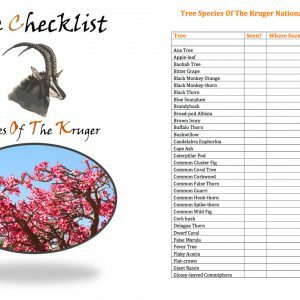 A variety of animals, from Grey Rhebok to Wild Dog and the birding is amazing on the H3. 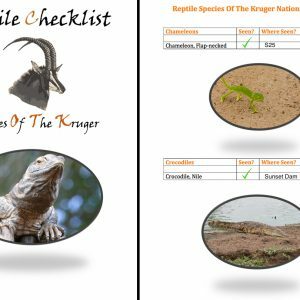 We have not seen many reptiles on this road though, but such is the Greater Kruger National Park, you just have to be in the right place, at the right time. We arrived after a 4-hour journey from Johannesburg, at Malelane Gate. We were there early, and could still hear the Fiery-necked Nightjar calling as we stopped and anticipated for the gates to open. 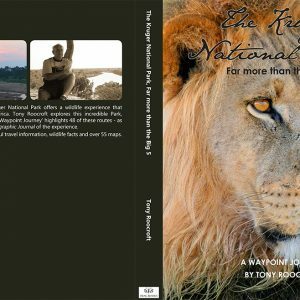 We also hear a Black-backed Jackal calling and the African Fish Eagle start off his day. We were in two cars, it was myself and Aimee in one, and Patrick, Skye and Adrian in another. We had “walkie talkies” or two-way radios to communicate in-between cars. This helped immensely on our trip. 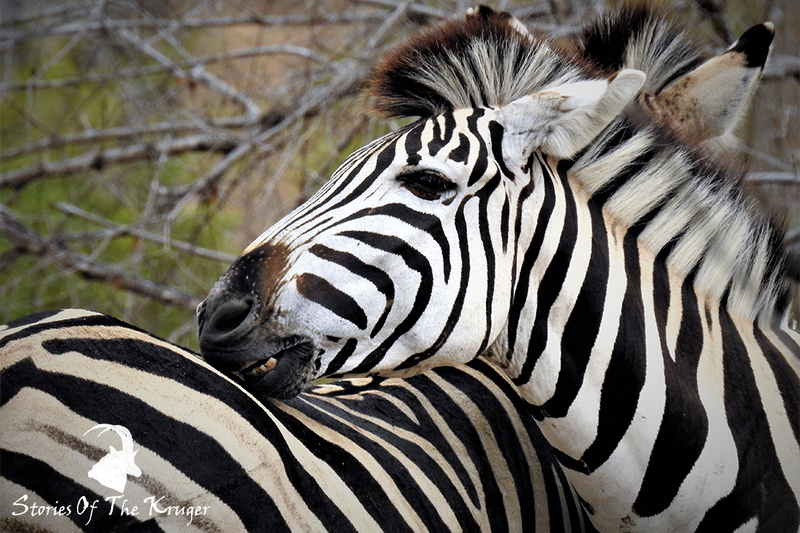 We would recommend this to anyone traveling in convoy in the Kruger National Park. So, it was up the H3 all the way to Skukuza. We had a fair distance to travel to get to Maroela… We had a brief glimpse of 2 Southern Black Flycatchers as we headed off, too quick for photo’s unfortunately, but great to see! 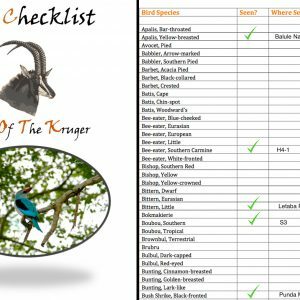 The normal bushveld birds were around as well; Magpie Shrike, Fork-tailed Drongo, Burchell’s Starling, Laughing Dove, Swainson’s Spurfowl, Yellow-billed Hornbill, Red-billed Hornbill, Grey Hornbill and the ever-beautiful Lilac-breasted Roller. 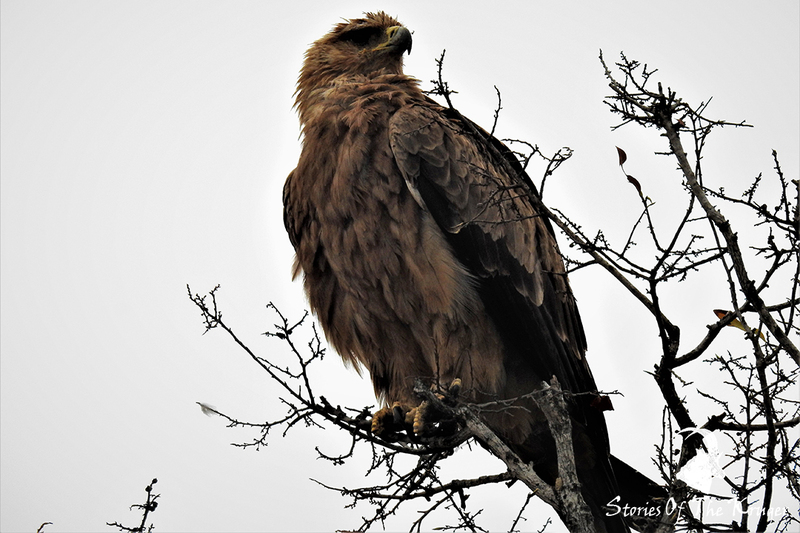 We saw a Tawny Eagle as well! The first animal to greet us was the Common Warthog, grazing in the early morning sunlight. Impala were plentiful, and surprisingly, so were Giraffe. We saw so many on the way to Skukuza, and throughout the trip. It was very nice to see. A Slender Mongoose crossed the road in front of us, with the characteristic black tip of its tail showing. We were in heaven. 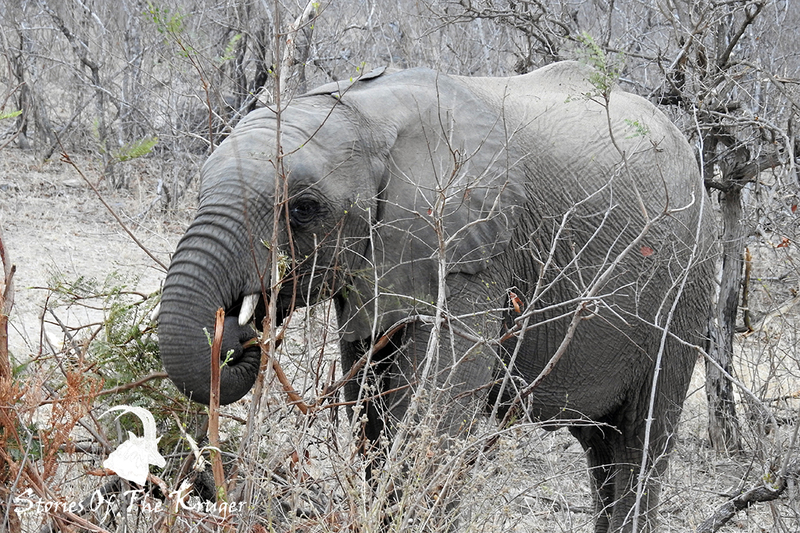 We then came across our first herd of African Elephants, our first of many, to Aimee’s delight. We saw Steenbok and Buffalo in the distance. 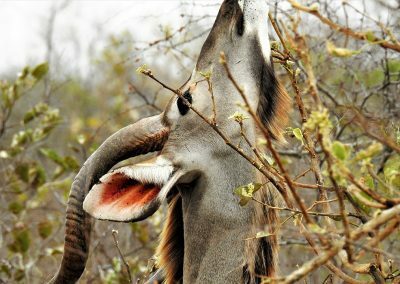 Kudu were also plentiful, and surprisingly very calm. This is the calmest I have seen Kudu in a long time, and that applies to the whole trip. We crossed the Mlambane River, which was dry, but we saw quite a few Little Swifts and Lesser Striped Swallows. 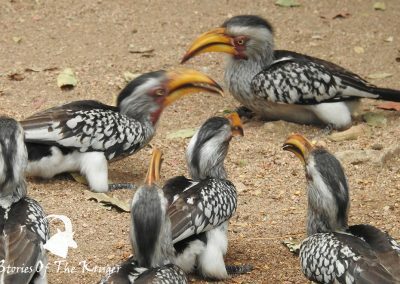 We continued to see more Kudu, Impala and a variety of bird species until we stopped at Afsaal for some much needed coffee. Afsaal still must be one of the best picnic spots in the Kruger National Park. It is clean, the service is great, and everything else is in great order, always worth a stop. 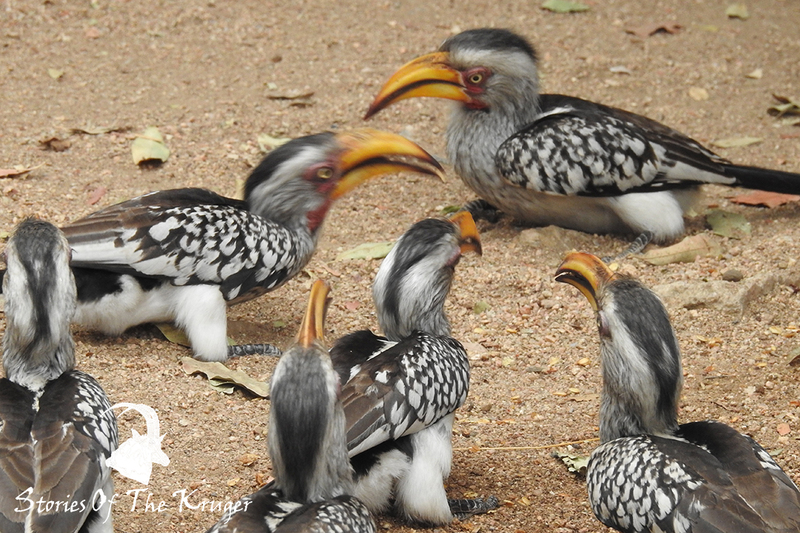 The picnic spot was full of Yellow-billed Hornbills, and there were Cape Glossy Starlings, House Sparrows, Red-winged Starlings and Natal Spurfowl foraging around. The walkie talkies were helping a lot, especially with birding sightings. 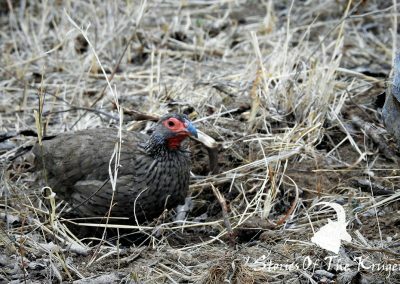 We started to see more interesting birds, like the beautiful Blue Waxbill, Helmeted Guineafowl, Yellow-throated Petronia, Red-billed Oxpecker, Amethyst Sunbird, Speckled Mousebird, Grey Go-away Bird, Crested Francolin and raptors. We were lucky with the birds of prey. 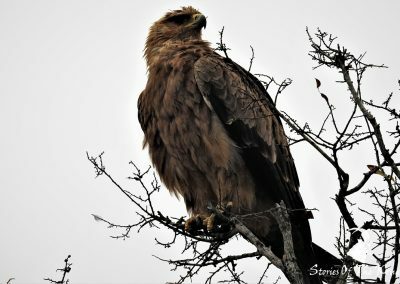 We saw a few juvenile Bateleur Eagles, Steppe Buzzard and even Brown Snake Eagle – I love these raptors. 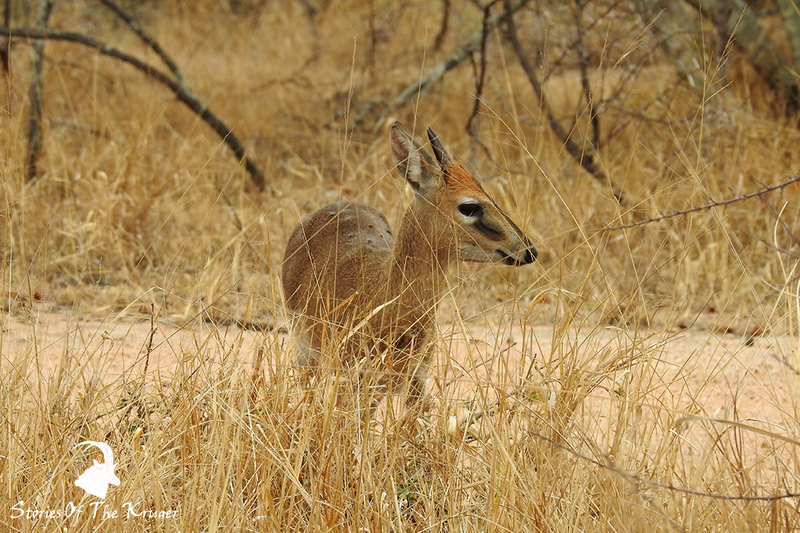 Along the way we had an amazing sighting of a Common Duiker. He was so calm, and not worried at all. 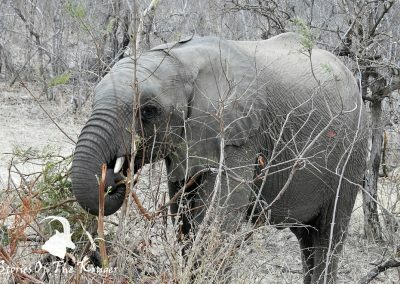 We managed to get one or two decent photographs of him and then he slowly made his way back into the bush. 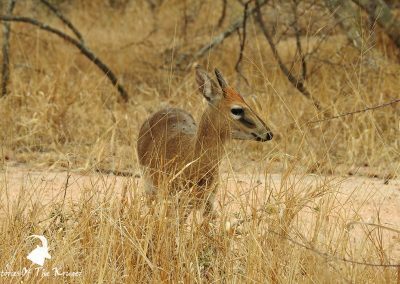 The word Duiker is Afrikaans, and means “to dive”. 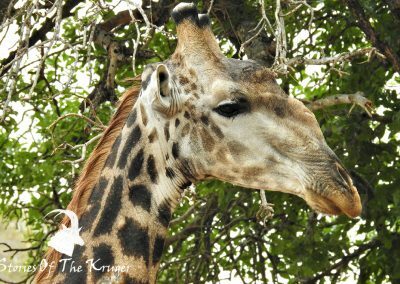 This is in referral to their defense mechanism towards predators as they dive into thick cover to avoid being caught by Leopards and others. 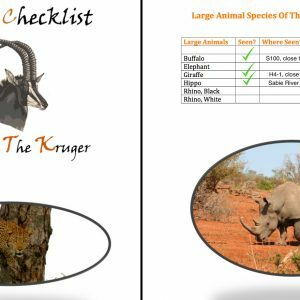 We stumbled upon Burchell’s Zebra and Blue Wildebeest close to Kwaggaspan. 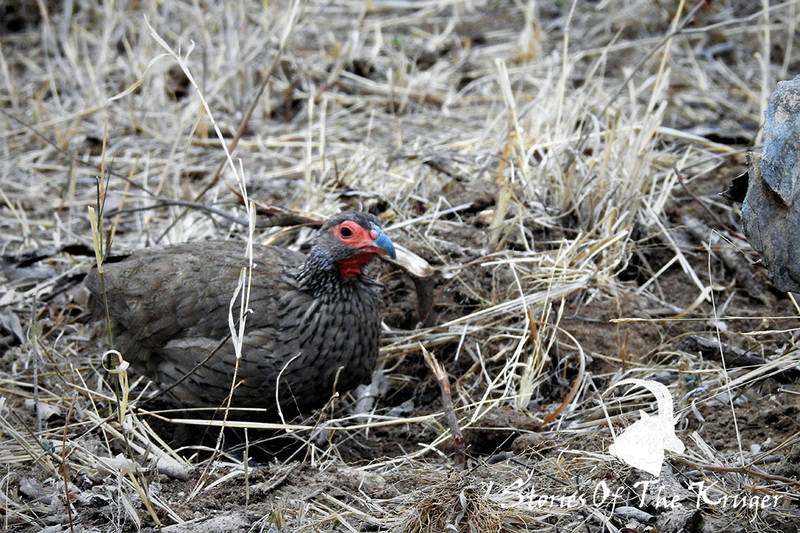 We continued to see some of the game we had witnessed earlier, and the birdlife was still prolific. It was overcast so I think that was the reason everything was so active. The Best Part Of This Drive? Our best sighting, which I saved for last, was close to Renoster Pan, much earlier. We were driving and saw two great things; both of the same animal. I have a love for the Spotted Hyaena, and the young are very cute. Our first sighting was of two juvenile Spotted Hyaena’s. Still very young. They were close top the road in thick grass and poor lighting, so the photographs did not come out, but we managed to get some video, which can be seen below. 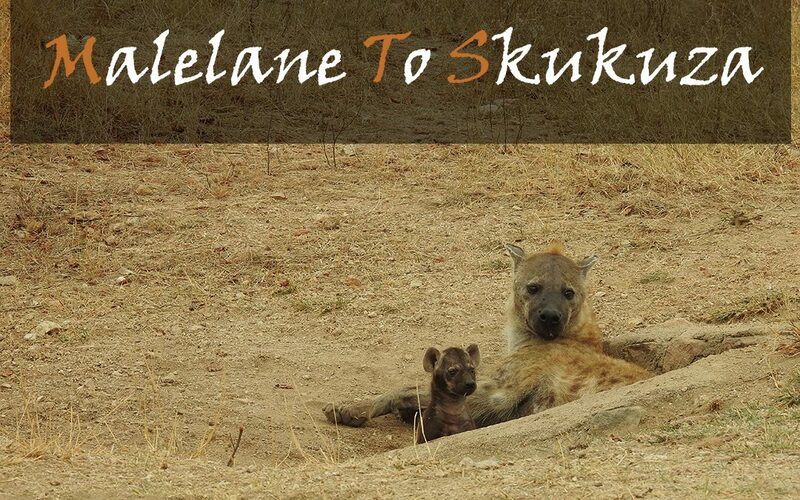 Then in a culvert, a mother and a baby Spotted Hyaena. The small Hyaena’s look like Bear cubs, and are so cute. This was really amazing. The baby Hyaena had a piece of grass in his/her mouth and was very curious. As normal, cars just drove past what was a fantastic sighting. I think because a lot of people who camp see the Spotted Hyaena all the time patrolling the fences, that they don’t really care for these kinds of sightings, but they definitely did not know there was such a small pup with the mom.